If your Miata headrest speakers are sounding a bit thin or are buzzing, unzip your headrests and take a look. You might be surprised to find torn cones and rotted surrounds. Or maybe the old factory speakers just aren't up to the capabilities of your modern head unit. Until now, there were no high quality replacements available. We're pleased to introduce you to the Millennium-5 speakers. Custom engineered by us specifically for the 90-97 Mazda Miata and patent pending, these brand new, high quality Millennium series speakers are the exact size of the originals. 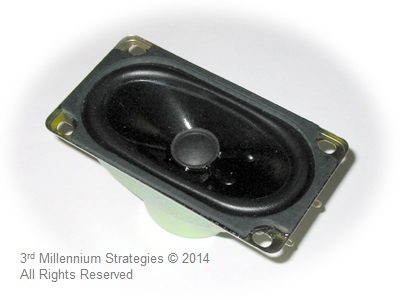 Please note that if you have an M-Edition Miata your speaker setup is different. Click here. 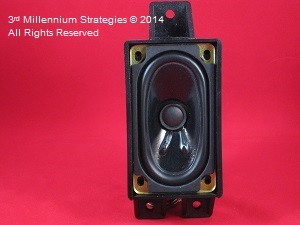 The Millennium-5's will simply screw into place in minutes and replace your existing, worn out speakers. See the picture below showing the fit in a stock headrest box (not included, but we have them available here). Installation literally takes minutes as the fit and screw holes are a perfect match. Much larger magnets than the original factory speakers and are rated to handle a larger continuous 10 watts of full-frequency power each compared to the oem speaker's 5 watts RMS. Butyl rubber surround. Most of the oem speakers failed because the paper or foam surrounds rotted away. With the Millennium-5's, the paper surround has been replaced with a high-compliance butyl rubber surround. This not only makes them moisture resistant, but also greatly increases the low-end frequency response. The Millennium-5's have a warm, neutral characteristic that can be listened to for hours without fatigue. Included Crossover / Blocking Capacitors. Each speaker now includes a 150uf crossover/blocking capacitor to maximize performance and help protect the speakers from damage. A $20 value - free! The frequency response is an impressively flat 100 - 14,000 Hz -3dB. 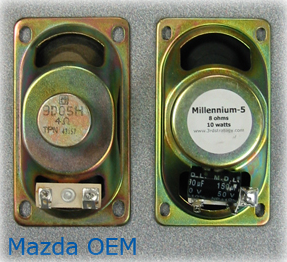 The impedance is 8 ohms which means these will work safely in any wiring combination you might want in your Miata with any radio and door speakers - serial or parallel. Our customers have installed these in every year Miata from 1990 through 1997 and with every type of radio from the stock oem radio up through high-end Alpine and Blaupunkt HD systems and they sound great. Because of the quality, the larger magnet, and wider frequency response, the sound is far superior to the original stock speakers. Forget about other vendors that try to sell you loose speakers and tell you to hack up your seats and then just stuff them in. Speakers without proper baffling (boxes or enclosures) just don't sound good. And if your Miata didn't come with headrest speakers or the speaker boxes are missing, don't worry! We've got replacement kits available that include oem fit boxes. Click here for more information. When you order you will receive (4) brand new speakers - a complete set for both seats. We offer a 30-day 'no questions asked' money back guarantee and a full 1-year warranty. International orders are welcome! We cheerfully ship anywhere in the world via US Postal Service First Class International service (up to 4lbs) which features a 5-10 day delivery time. Above 4lbs requires shipment via US Postal Sercice Priority International which does add significantly to the cost. Note that a single set of any of our speakers weighs less than 4lbs. Please note that any duties or taxes assessed by your country's customs authorities are your responsibility. To see shipping charges to your location, add your items to the shopping cart, enter your address including your zip code or country, and pull down the shipping selector. We do not mark up shipping charges!